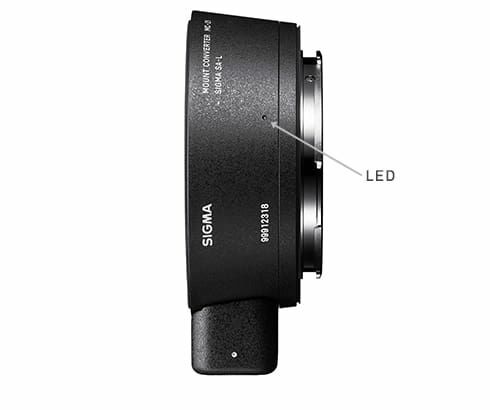 The Sigma MC-21 Mount Converter/Adapter gives shooters using L-Mount  cameras such as the Panasonic S1 , a wider range of lens options by allowing Sigma EF-Mount and SA-Mount lenses to be used. Attaching the MC-21 to an existing Sigma SA or EF mount compatible lens will allow them to be used as L-Mount system lenses. The MC-21 features a small LED light on the outer part of the ring that changes colour depending on the compatibility of the attached lens. A green light indicates full compatibility, orange indicates compatibility, but that the lens requires a firmware update and no light at all indicates that the lens is not compatible at all. There are over 29 lens profiles, (including full-frame and APS-C lenses) pre-loaded on to the MC-21 that optimize the autofocus and aperture control for each lens. The MC-21 also supports camera correction functions such as peripheral illumination, chromatic abberation of magnification and distortion. The MC-21 also comes equipped with a socket for mounting a tripod and the inside of the barrel is covered with flocking to prevent internal reflections from reducing lens performance. The Sigma MC-21 Mount Converter (Canon EF Lens to L-Mount Body) ships towards the end of May and retails for $329.99 CDN. – Please note the following information when using the SIGMA MOUNT CONVERTER MC-21 in combination with LUMIX S1 and LUMIX S1R released by Panasonic Corporation.